In industrial countries, modern agriculture with its yield maximising high-input technologies generates environmental and health problems that often do not serve the needs of producers and consumers. Agriculture must be conceived as an ecological as well as a human dominated socio-economic system. Agricultural challenges have evolved from technical to also include social, cultural, economic, and particularly, environmental concerns. The agro-ecological approach is more sensitive to the complexities of local agriculture, and has broad performance criteria which includes properties of ecological sustainability, food security, economic viability, resource conservation and social equity, as well as increased production. One of the African Biodiversity Network’s principles recognises the devastating impact of colonisation and industrialisation. ABN accompanies communities in a patient, non-prescriptive and potent way that draws particularly on the knowledge of elders towards deep level transformation. 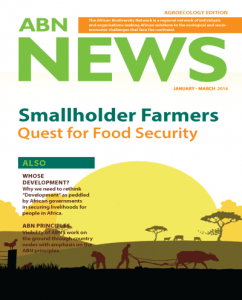 In this issue, we walk you through what ABN does to achieve this. Through our Partners, we accompany, encourage and support farmers to participate in the formal seed supply sectors, including their traditional knowledge in seed selection, saving and exchange. Women in most African traditions have played a central role in selecting, storing, and enhancing the diversity of their seeds. To produce food for their families in varying conditions, they developed a sophisticated capacity to understand their ecosystem and the climate, making very accurate calculations as to what to plant in the coming season. Regionally, the African Biodiversity Network’s Partners are working towards increasing the capacity of small scale farmers to acquire skills and knowledge in agroecology and amplifying issues that arise from it locally, nationally and internationally with support from ABN’s donors and other networks like AFSA and the Gaia Foundation who mainly amplify our work at the international level. Finally, agro-ecological practices have been in existence for years where farmers, particularly smallholder farmers, are engaged with the context based agriculture guided by the Law of Nature, diversified cultures and based on diversity of food systems.